Brake camshafts are used in Simplex drum brakes. They serve to transfer the power generated by the pneumatic brake cylinder, via a slack adjuster, to both brake shoes. For this purpose, a tooth system is installed on the drive side of the brake camshaft (to hold the slack adjuster) and a Z-cam on the output side (to spread the brake shoes). Upon actuation of the brake camshaft, both cantilevered brake shoes are pressed against the brake drum. The wheel is slowed down or brought to a standstill. All DT® Spare Parts brand brake camshafts are made of high-quality tempered steel. By the inductive hardening of the z-cams, the bearing seats of the brake shaft bushing and the serration, a long service life is guaranteed. The brake camshafts, which are machine made with extremely narrow tolerances in all areas, conform exactly to the manufacturer specifications, thus providing optimal fitting accuracy. 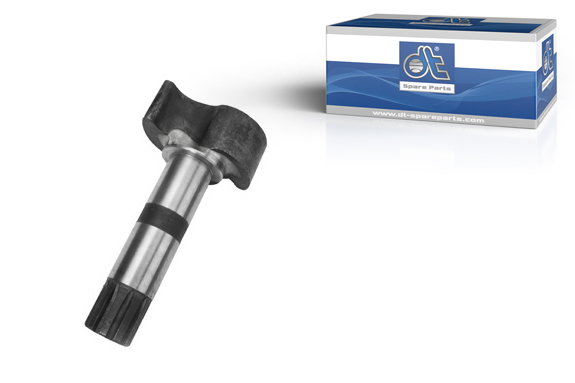 In addition to all standard brake camshafts, the comprehensive DT® range also includes a variety of repair kits.